simplicity n. the quality or condition of being plain or natural Most days, I am a sherpa. My mornings begin with bags – bags for everything – most of which filled with things that do not belong to me. There’s the lunchbox that gets loaded with mac n cheese, goldfish and sometimes the odd cookie or over ripe banana. The tote bag with swim trunks and water shoes for water play on Tuesdays and Thursdays. The back pack with extra toy cars and a full water bottle. My purse stuffed with train passes, mints, and hopefully my wallet and keys. My gym bag or extra tote for the massive book I am reading plus extra “office” shoes that I swap my flip flops out for. Sometimes there are more bags, sometimes (if I am lucky) there may be less. Such is the life of a working mother. Shuttling to daycare, running to the train, walking through the city streets in snow, sleet, hail and heat to get to work on time. What I crave most these days than anything else is simplicity, some spare moments of ease. When I was a stay at home mom, I found those moments during nap times, sometimes in the simple acts of folding tiny clothes, stacking diapers in the nursery closet or preparing new foods for Graham to try. 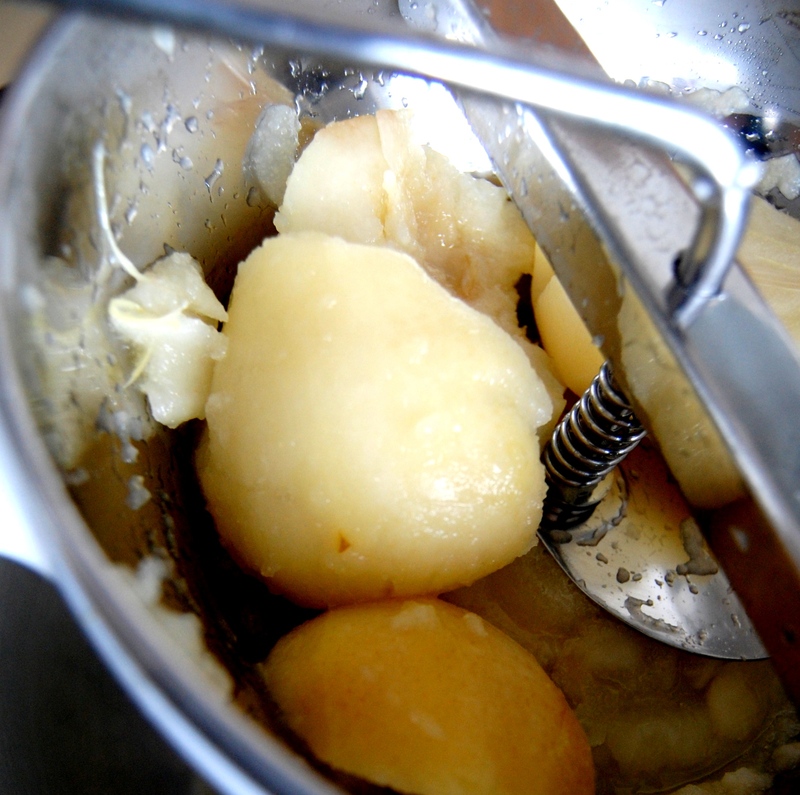 I didn’t know back then when I was steaming and coring out pears with a spoon to make Graham a new puree that I was actually preparing for my future at OXO. It’s one of the more interesting twists in my life story – that my break from the working world was more like a learning sabbatical for my next career adventure and that I’d form such an intimate relationship with the tiny containers with the snap on green rimmed lids that I came to love so much for their simplicity while I was a suburban stay at home mom. I’ve come to appreciate the art of making baby food on a much different level since starting my job. I have an appreciation for textures and notice the way things freeze and expand, how products work for or against these natural tendencies. I’ve also learned how to accentuate otherwise bland and subtle flavors with the addition of spices, adding gradual complexity to an otherwise simple fruit or vegetable. Now that Graham is 3, he eats much more complex foods – most of the time not without coaxing and bribery. Whenever I miss those early, simple days when pears and apricots were earth shattering flavors and vanilla and cinnamon were his first tastes of sweetness, I head into the OXO kitchen and cook up some new purees to remind myself of the simple joy of making a child’s first foods and to appreciate how small and simple it all once was and how far we both have come. 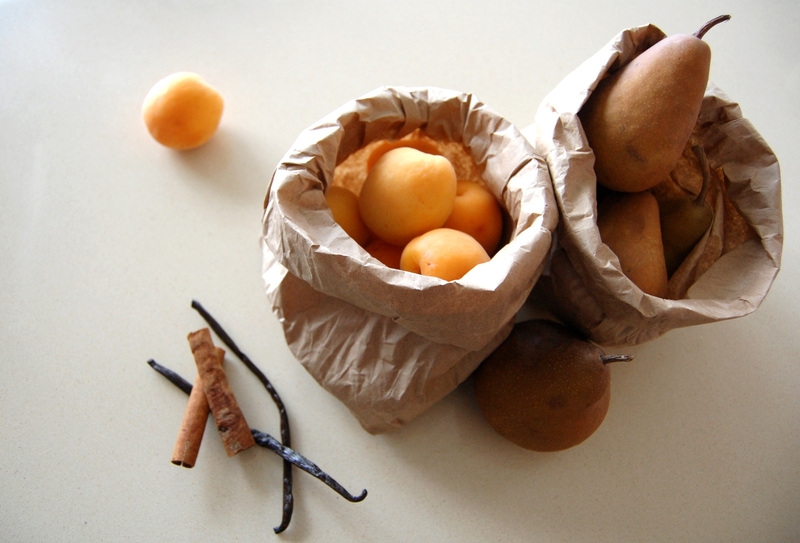 These are 2 simple baby food recipes that bring me back to those simple days… Pureed Pears with Vanilla Bean & Steamed Apricots with Cinnamon Apricots are beautifully in season this time of year and pears, to me at least, are a year round favorite. It all starts with finding the nicest and ripest fruits. Those are the ones that have the strongest natural flavor. Don’t skimp on good quality spices. Since the vanilla bean and cinnamon are the stars of the show, invest in actual cinnamon sticks and real vanilla beans instead of pre – ground powders or extracts. 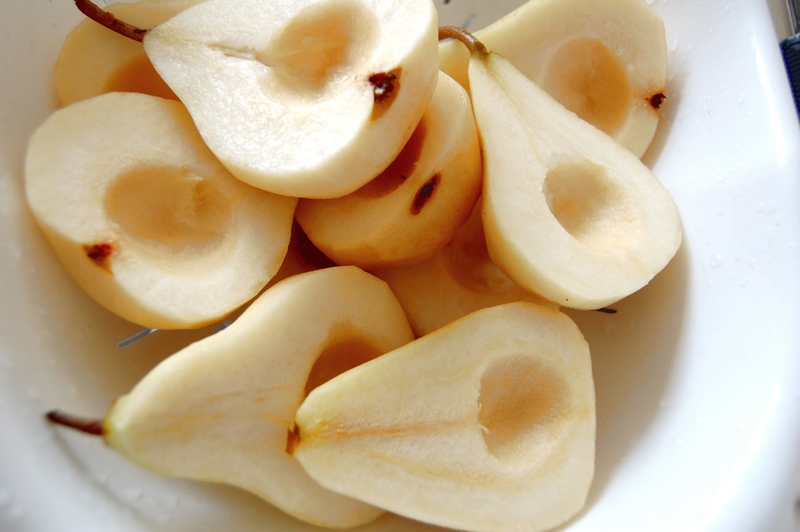 Clean and steam the pears and apricots (my favorite part is coring out the centers of the pear with a spoon…they always look so fresh and beautiful.) 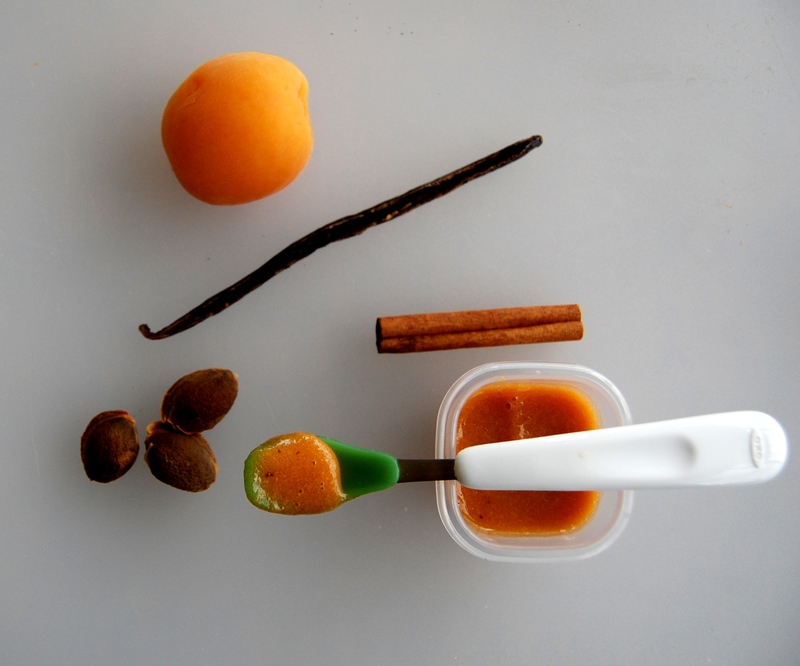 The skins of the apricots should slip off easily after steaming for about 15 to 20 minutes. Cut them in half and remove the pits as well. 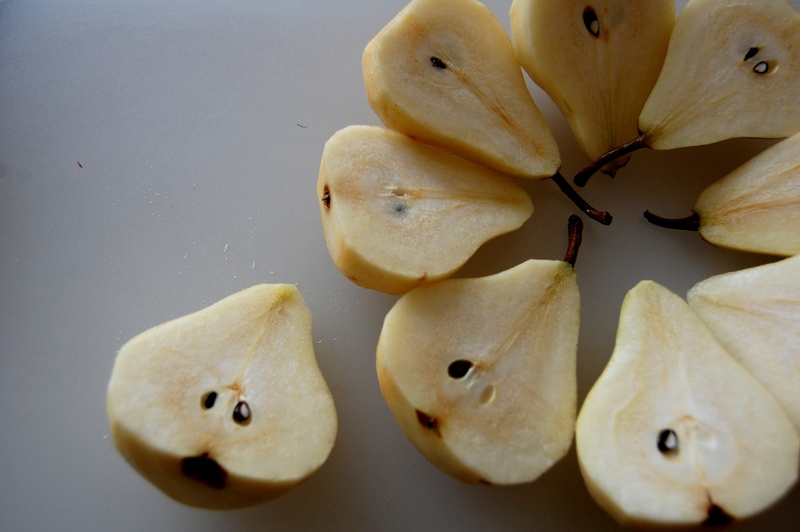 I like using a food mill to puree the steamed pears and apricots. You can choose how fine your puree will be by switching out the plates in this OXO Food Mill, which is great for when you’re child is ready for more textured and chunkier foods. Once you have your puree, you can slit open the vanilla bean and scrape it with a paring knife to remove the beans. Then mix it into your puree. 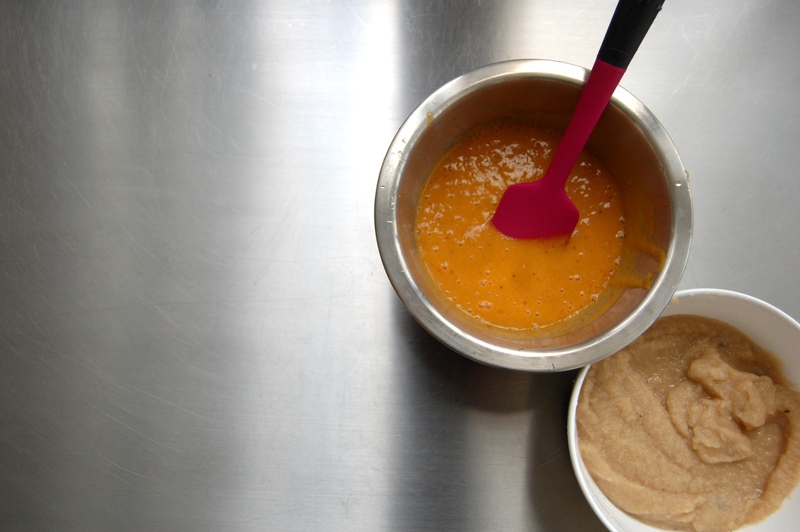 For mixing in cinnamon, you can use a small grater directly into the puree. Taste as you go along to gauge the strength of the flavor based on what you think your child is ready for. My son enjoyed the stronger flavors, but every baby is different and moms tend to know what is best for their child. You’re done! It’s as simple as that. 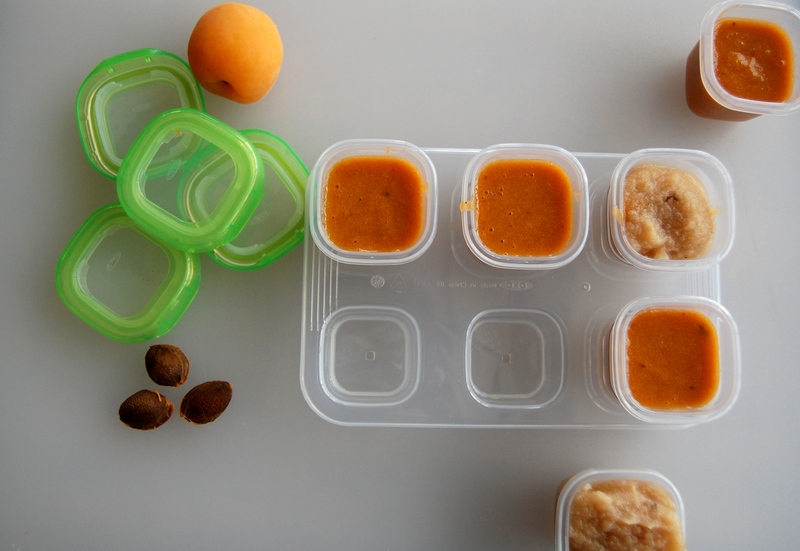 Feed fresh or freeze your puree into blocks for thawing later. OXO Tot Baby Blocks are great for early stage purees as they come in 2 oz. 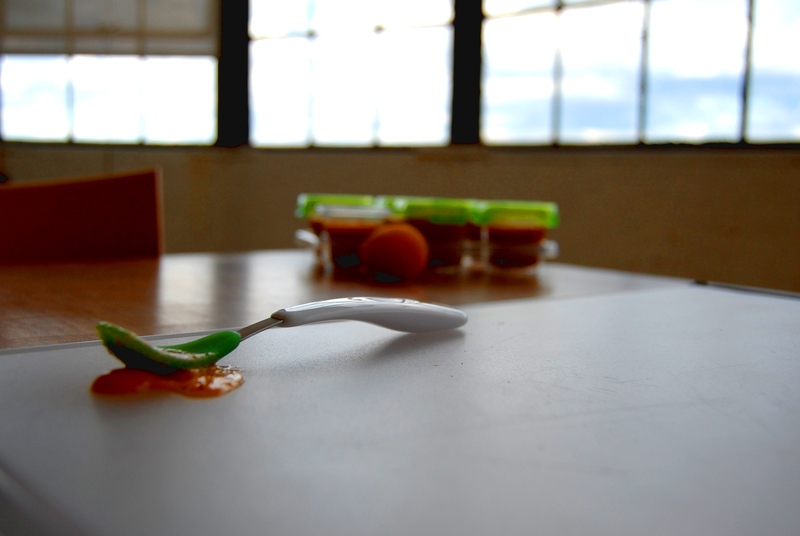 portions that can later be used for daycare and play date snacking as your child grows. Disclosure: I am employed by OXO and received these products for free. The views and opinions expressed on this site are my own alone and do not represent the views of OXO and/or its affiliates.